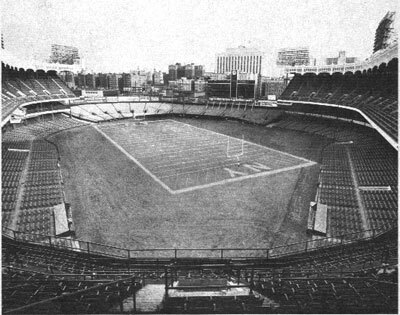 The New York Giants began playing their home games at Yankee Stadium in 1956. In 1957, they won the NFL Championship game there against the Bears, 47-7. In 1958, in a late season game played during a blinding snowstorm at Yankee Stadium, Pat Summerall kicked a "rumored" 49 yard field goal to beat the Browns 13-10 and force a one game playoff against the Browns for the division title. The playoff game was also played at Yankee Stadium, and also won by the Giants, 10-0. This set the stage for the "Greatest Game Ever Played", the NFL Championship played between the Colts and Giants at Yankee Stadium, and won by the Colts in overtime, 23-17. 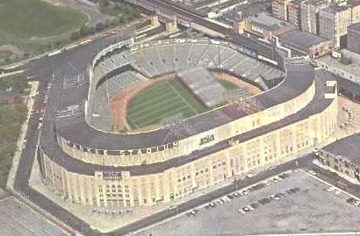 In 1962, Yankee Stadium would play host to its final NFL Championship game, with the Packers defeating the Giants 16-7. 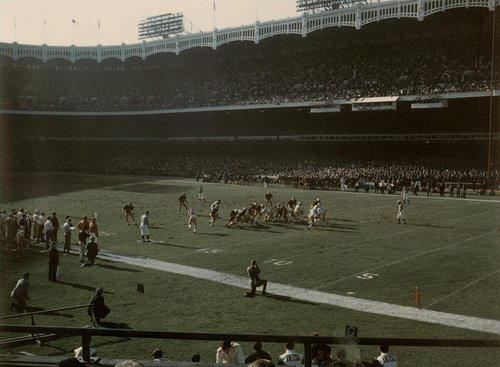 Due to the renovations of Yankee Stadium, the Giants were forced to move to the Yale Bowl for the 1973 and 1974 seasons. The Giants than played at Shea Stadium for one year before moving to the "Swamps of Jersey" in 1976. The original Yankee Stadium was host to many monumental football games, beginning with Notre Dame-Army clashes in the 1920s. While the New York Giants were playing across the Harlem River at the Polo Grounds, several football teams named the Yankees played at the Stadium, including one in the All-America Football Conference (AAFC) from 1946 through 1949. The Giants moved into the Stadium in time for the 1956 season, and that year won the NFL championship against the Bears. 1. In what is called "The Greatest Game Ever Played" the Baltimore Colts defeat the New York Giants, 23-17, in overtime in the game that raised the profile of the NFL. Alan Amache, above, scores the winning touchdown in the December dusk, 1958. 2. At halftime of a scoreless game, Notre Dame coach Knute Rockne urges his squad to "Win one for the Gipper." And the Irish do just that, rallying to defeat Army, 12-6, in honor of the late Irish All-American George Gipp, 1928. 3. In a game that features four past or future Heisman Trophy winners (Doc Blanchard and Glenn Davis of Army, Johnny Lujack and Leon Hart of Notre Dame), the number one ranked Cadets and second-ranked Irish play to a scoreless tie, left. Lujack's game-saving tackle of Blanchard preserves the tie in the "Battle of the Century," 1946. 4. Much as they did 22 years earlier at the Polo Ground, the Giants don sneakers instead of football cleats on an icy field. New York overwhelms the Chicago Bears, 47-7, to win the NFL championship, 1956. 5. Pat Summerall kicks a 49-yard field goal in a swirling snowstorm to give the Giants a 13-10 win over the Cleveland Browns, forcing a playoff for the NFL East crown. The Giants would go on to down the Browns in that playoff and advance to the NFL championship game, 1958. 6. Undefeated Fordham and the Seven Blocks of Granite need one more win to reach the Rose Bowl, but NYU beats Vince Lombardi and company and spoils their Thanksgiving, 7-6,on a muddy field, 1936. 7. Giants quarterback Y.A.Tittle ties NFL record with seven touchdown passes against the Washington Redskins. The Giants win the game, 49-34, 1962. 8. In the second and final edition of the Gotham Bowl, right, Nebraska edged Miami, 36-34, despite an MVP performance by Hurricane quarterback George Mira. Only 6,166 brave the bitter, 14-degree temperatures, 1962. 9. Yankee Stadium plays host to its final NFL Championship game, with the Green Bay Packers defeating the Giants,16-7, on the strength of three field goals by guard Jerry Kramer, 1962. 10. Central State University of Ohio defeats Grambling, 37-21 in the final Whitney M. Young Urban League classic and the last football game ever played at the old Yankee Stadium. "They just came to play; we didn't," said dejected Grambling coach Coach Eddie Robinson. 1987.